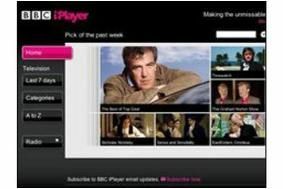 BBC iPlayer breaks records with 120 million requests | What Hi-Fi? Figures released by the BBC showed the week of 4-10 January set a new record for total requests (23.8m) and radio requests (8m). Boosted by catch-up viewing after Christmas, Doctor Who and Gavin and Stacey proved popular requests. While requests via PC or Mac dominate, numbers accessing via a Wii or PS3 increased, totalling 4% and 8% of the total respectively. Viewers remain skewed in favour of males and under-55s, while on-demand TV is the main request, with only 8% of requests being for live TV streaming. The BBC iPlayer now averages over 3.2 million requests for programmes a day, from an average of 1.3 million unique users a day. The final episode of Top Gear was the most viewed, with over 1.1 million requests, while Test Match Special coverage dominated the radio requests.